Testimony to the Maine Legislature. Sometimes the order had my name on it, even though I would not have ordered the vaccine. I assumed that there were studies on the subject, and writings in the medical literature, in order for them to be so sure of the rightness of their policy. After all, it’s science we’re talking about? And the science is supposed to be all settled on the safety and effectiveness of vaccines. Because the hospital policies were centered on flu and pneumonia vaccines, this was where my research started. This paper outlines the many issues involved in adult vaccines and kidney patients. So, I discussed all this evidence for over a year with the administration and with my various colleagues. Other doctors were starting to change their previously set minds, and a high number of nurses were catching on. But then, because the hospital administration could not rebut my arguments, they called upon an expert to set me straight. He never addressed any of my questions regarding acute kidney patients or acutely ill new admissions. He gave me a list of studies showing that some vaccines raise antibody levels in most immunosuppressed people with HIV or kidney failure. His argument was that ipso facto, for acutely ill kidney patents with sepsis, heart attacks, Guillaine Barre Syndrome, cancer, urinary tract obstruction, nephrosis and so on, vaccines were also safe . His letter was quite bizarre. I kept thinking, “And this is the expert? Why can’t he answer to my specific concerns? Where is his proof that side effects don’t happen to my patients?” Nowhere, could I find studies that looked at vaccines in acutely ill patients commonly seen by nephrologists. Even my pro-vaccine colleagues agreed that there was no scientific basis to give these injections so quickly upon admission, and supported my motion to have the policy changed to vaccinate at discharge. At the same time, the hospital turned up the heat on me. My progress notes in hospital charts were reviewed, which was something totally new to me. Nobody had ever before challenged my integrity, or patient care. The consultant said that BECAUSE there were no published data sets showing influenza vaccines caused kidney ailments, that my suggestion to exercise caution vaccinating acutely ill patients was unwarranted. Yet he never showed me any data sets demonstrating that is was safe to vaccinate heart failure, sepsis, inflammatory kidney patients and the like. The executive committee of my hospital also told me that it was not appropriate for me to stop vaccination orders on my patients and that I was confusing the nursing staff. However, nurses rarely use the SAME treatment plan for all patients so this made no sense to me or the nursing staff. My experience was not one of confusing nurses at all, but of finding other vaccination critical people on the hospital staff who agreed with me. Among the nursing staff, there were more allies than I would have imagined. Once I realized the problems with adult vaccines, I researched the issues with childhood vaccines, the result of which is a book called Dissolving Illusions: Disease, Vaccines, and the Forgotten History. Even if vaccines can protect for some diseases for a period of time in a lifespan (which is the best that some of them can claim), the assurances given to both sick and well people regarding safety and effectiveness is not backed by science, history, or even much of the medical literature. We have peer reviewed writing that details the historical tragedies with vaccination campaigns. We have case reports of unexpected vaccine injury, and we know some of the mechanisms of vaccine injury. We have a list of highly educated whistle blowers who were harassed and silenced by government agencies for trying to protect the public from drugs and vaccines they knew were unsafe. We have prominent pro-vaccine vaccinologists today stating that pertussis, flu, and measles vaccines are failing and that the problem is not just vaccine refusal, but they are ignored. My position is that vaccines are not guaranteed to be safe, that ongoing production problems do exist, that foreign animal DNA, and chemicals are in the vaccines, which don’t reliably protect. The public is given a false sense of security over the safety and efficacy of vaccination. There is no literature on the safety of vaccinating the kinds of sick people I tried to protect. There is evidence that viruses from the 1950s were introduced into the human population via vaccination, that can and do cause cancer and are related to other medical problems. The attempts of scientists, to look in depth at these issues have been sabotaged and discouraged. Today, we continue to have vaccines contaminated with animal viruses such as porcine circovirus in rotavirus vaccines, that third parties discovered — not the vaccine manufacturers. I left my career, my financial stability and everything comfortable and familiar in order to spend uninterrupted time researching vaccines in all aspects; the need for them; their manufacture; the safety, and any other aspect that was related to the topic. I foresaw that this day would come when parents could lose the right to refuse any of the 69 doses of 16 vaccines scheduled by the age of 18, the first being an aluminum loaded vaccine on the day of birth. 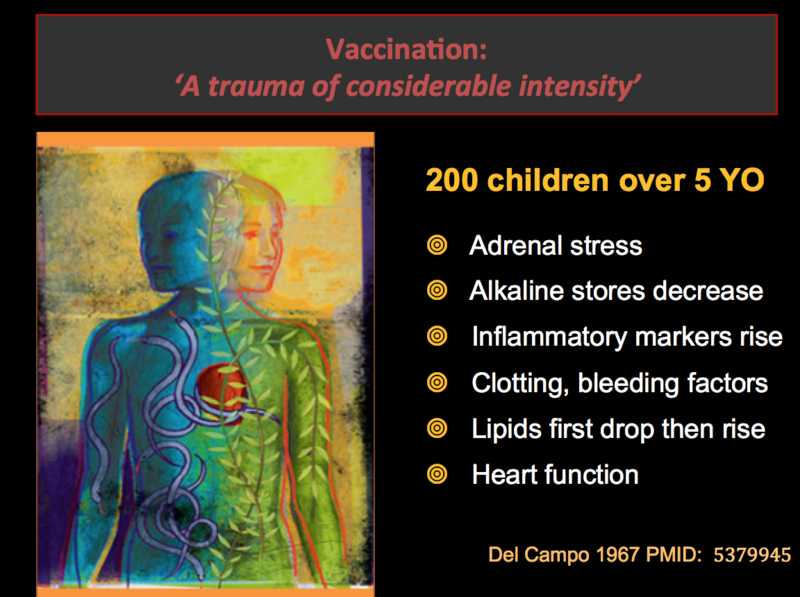 I have spoken publicly on many areas of infant immunity, kidney function, aluminum toxicity, and most of the vaccines individually. These videos are all available for free on youtube. No doctor walks away from a lucrative and successful career the way I did if there is no cause. where I provide medical journal references for everything I have said in this letter, including the well known conflicts of interest in the members of the ACIP, CDC and WHO. 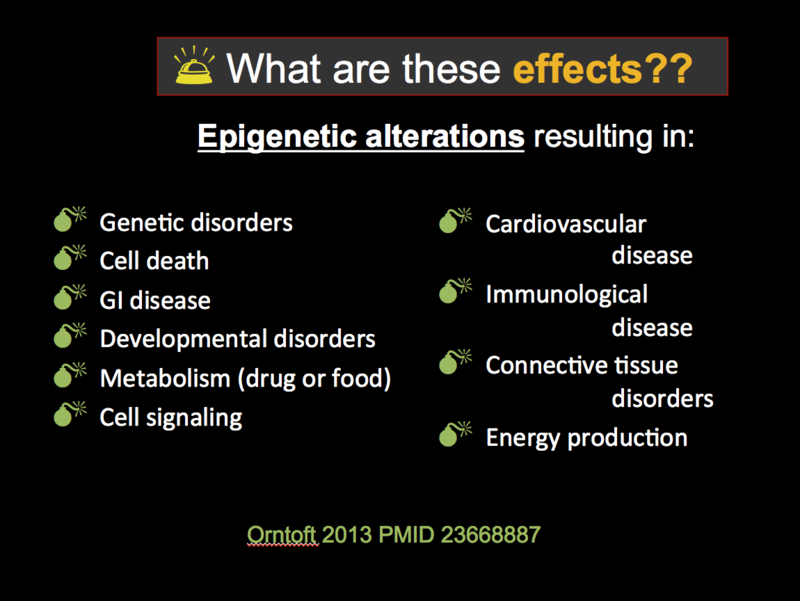 Interestingly, it is almost impossible to find any other studies looking at the metabolic impact of vaccines given today. 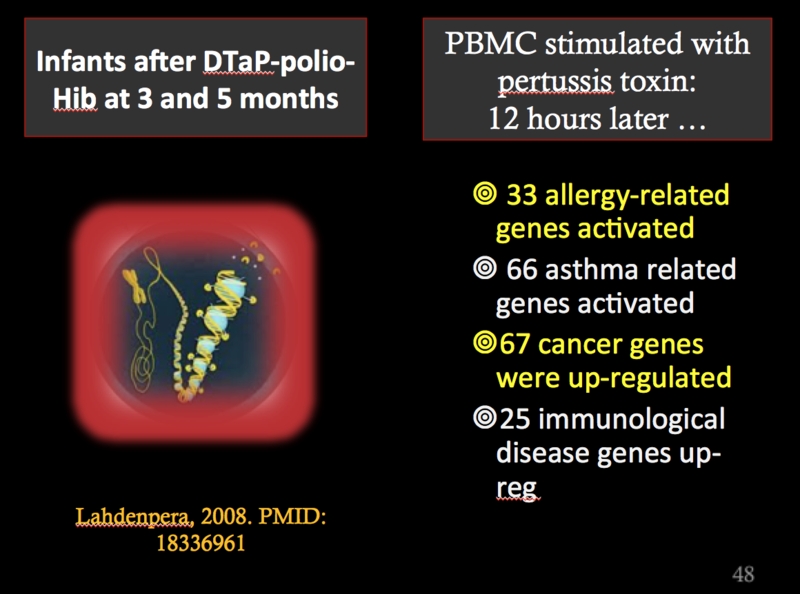 But there are other studies that show how cancer genes, autoimmune genes, allergy and many other disease-causing genes are upregulated after vaccination. I will also include those studies, Orntoft and Lahndenpera and the slides in this letter. In 2013, Dr Orntoft published research detailing the genetic network changes in white blood cells before, and six weeks after, DTP booster vaccination in 8 different girls. Here is a list of the top networks altered after the vaccine. Swedish authors Lahdenpera et al. 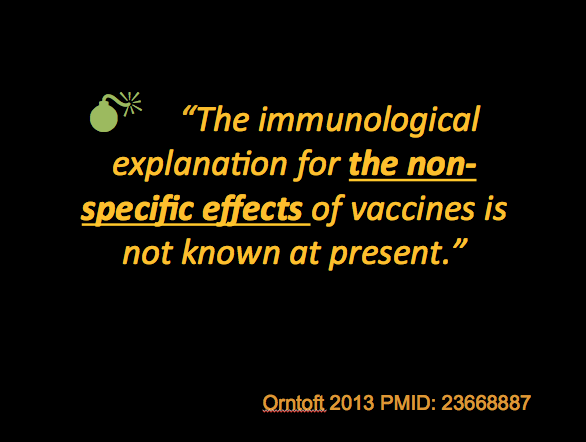 prove that what Orntoft found, is also true for DTaP as well as DTP and that the potential outcomes for vaccinations could be quite severe. In my opinion, because there is no study that has looked for such problems at the appropriate time frame, there is no guarantee of saftey. One look at these summaries should alert any reader that no parent can be guaranteed their child will be better off getting vaccinated. To force such vaccine policies and injections onto the children of Maine in my opinion is an egregious crime. We have no studies looking at the long-term effects of this growing vaccination program as a whole, for cancer, neurologic disease, autoimmune diseases and allergies and other chronic diseases that have become epidemic in children at the same time the vaccine programs were ramped up in the 1980s and 90s. If you think you are voting away the philosophical and religious exemptions of the parents of Maine, in order to create herd immunity and protect anyone, you just don’t have all your information. And worse, if you vote to remove exemptions, you are naïve to the fact that you will be next in line for a barrage of vaccines as adults. If this legislation is passed then you are paving the way for not just the aggressive vaccine policy of today but of a future in which you will not be allowed to turn the clock back. This entry was posted in Uncategorized and tagged Maine vaccine, Suzanne Humphries, testimony. Bookmark the permalink.